Distance: A hellish and relentlessly long steep climb up! Real distance unknown ~ probably just as well! It was the final push to the top. We all knew we were close now and with every agonising step we dug deeper into our souls to find the strength to keep going. The only problem with the sun having risen was that now we could see exactly what was coming up in front of us. In those crazy moments I almost found myself wishing it was dark again. In the light of day we could see how steep the climb really was and for the first time I realised why we had zigzagged all the way up from base camp ~ it is just too steep to go straight up. Time for me was becoming a bit of a blur. I don’t remember much from the time the sun began to rise to until we reached Stella Point. You could say I was literally out of my mind ~ I was no longer there. Physically yes, but mentally I was gone. Drifting in and out of consciousness as I slept my way up the last agonizingly steep section, everything just began to blur. I remember pieces in sections and I recall how heavy how my legs felt, like I had led stuffed into my hiking boots as I tried hard to lift my feet up to take another step but only managing to drag my feet mere millimetres above the grounds surface. 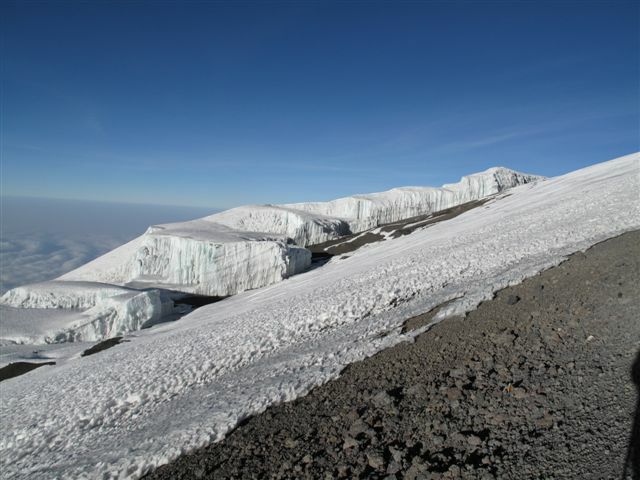 If I could laugh I would have for there I was on the slopes of this large mountain doing the Kili shuffle! It was something we had joked about before we had left for our trip. It felt like we were hardly making any progress that we needed to in order to reach the top of this mountain. No one spoke but we were still all together. Somehow, yet again, knowing we were all still together propelled me forward. I wondered how the others were doing. Were they fighting the negative demons in their mind? Were they hurting? Were they breathing as hard as me. Were they fighting to stay awake too? I recall the look in Milton’s eyes as he asked me for the hundredth time if I was still doing okay. Compassion poured from his soul out through his eyes and all I could do was what felt like a nod of my head up and down as I blinked my eyes to signal yes I was ok. In my wakeful moments, which were few, I kept my head tucked down. Partly, to shield myself from the bitterly cold wind that was still blowing strong and partly so that I did not have to put myself through seeing what we still had to climb. Milton had taken my trekking poles at some point during the night and both he and Moses were supporting my arms walking with me. A few others had also given up their backpacks to our guides who were now carrying them on their backs and across their chests. This was just another day ‘in the office’ for our guides. For us, it had been a long night that was both mentally and physically challenging and it was by the kindness of people who had started out as strangers, who made us feel safe in the darkest night of the unknown. Despite how I was feeling I knew that I would conquer this mountain and not once during what can only be described as the hardest night of my life did I ever consider turning back. The exhaustion is indescribable, the thoughts that fill your mind are not wanted, your legs are beyond tired and you struggle to take another step but somehow you still you push on. Turning back was not an option. I think deep down both my body and my mind knew this and I knew I had to keep pushing through the pain, the cold and the utter exhaustion that completely consumed me. It had become a common sight now, heads slumped and feet dragging as hikers stumbled forward as if they were drunken sailors. This mountain was taking its toll on everyone ~ no one was spared except for maybe the guides who were leading us up. In one of my moments of wakefulness I was unlucky enough to see a fellow hiker being rushed back down the mountain by a guide. The tears instantly burned my eyes and I had to fight hard not to completely break down. Did they make it to the summit? Did they get to experience that joy after all the pain? Or did they not even get that far? This mountain was unforgiving and as I began to drift out of consciousness again, I began to say a prayer. The pace was painfully slow but I don’t think any of us could have gone any faster if we tried. I began to count my steps, One. Two. Three. Four. Five. Six. Seven. Eight. Nine. Ten. In tiny bits, it’s all I can do to stay focused in my wakeful moments. One. Two. Three. Four. Five. Six. Seven. Eight. Nine. Ten. One. Two. Three… I hear Thomas shout out to us, “That’s Stella Point ahead.” I don’t think I really understand or comprehend what he is saying. The final uphill climb is brutal. I look up but see nothing but ridiculously steep mountain in front of me. I should never have looked up. I put my my head down again and followed my team mates’ footsteps as he walked in front of me. Up front, Donna was still out, with Dixon leading her up. We are all still together. Knowing this filled me with happiness for a brief moment. One moment I’m walking and the next moment in my mindless state of following my team-mate in front of me I had failed to notice that he had stopped and almost bumped into him. 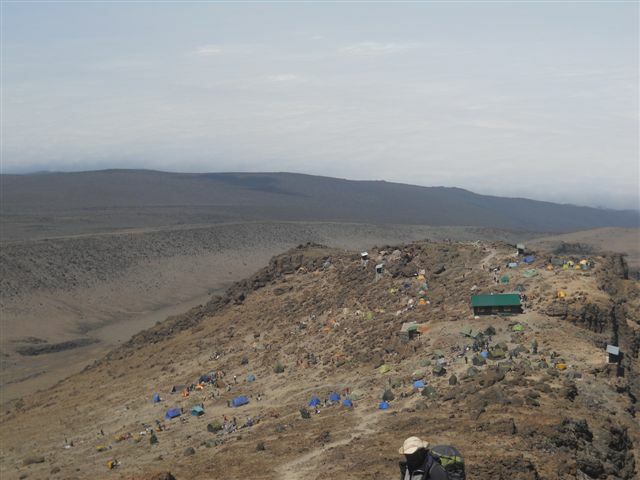 We had finally reached Stella Point and crested the steep ridge overlooking the crater. There was a buzz in the air and it was quite busy. I’m not really taking anything else in. I stand there feeling like I had just woken up, which technically I had and I was struggling to focus. At some point during the last section, Moses raced up ahead of us and as we reached Stella Point he produced a flask and poured each of us a luke warm cup of tea. Words cannot describe how good it felt to indulge in a pleasure like that, one that we normally take for granted. The wind was howling and it was so ridiculously cold so we moved to the side for some shelter by the rock and sat down, my gloved fingers wrapped around the mug for some extra warmth as I savoured the milestone of reaching Stella Point while drinking the best cup of tea I think I have ever had in my life! It was good to sit in the sunlight and sip on our tea. It felt good to be at Stella Point, standing on the crater rim, but it was strange how I didn’t get outwardly excited about that fact. I felt kinda blank. I was happy and relieved to have reached this point, yet showing very little emotion. The exhaustion was all-consuming, not leaving much room for anything else. I knew it wasn’t over yet. We still had further to go. As I sat there between my team mates, I noticed that people were neither high fiving each other nor anyone popping the champagne. The exhaustion was overwhelming. Some people stop at Stella Point, unable to go further or happy with their achievement of getting this far. 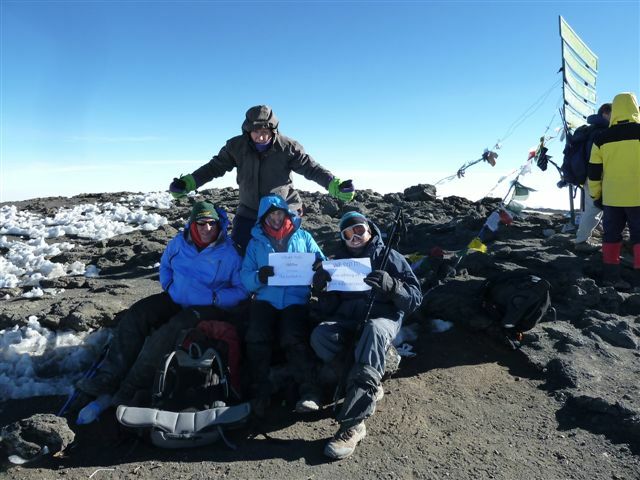 Stella Point is recognised as part of the summit and those who reach this point will still be awarded with a certificate of their Stella Point summit. 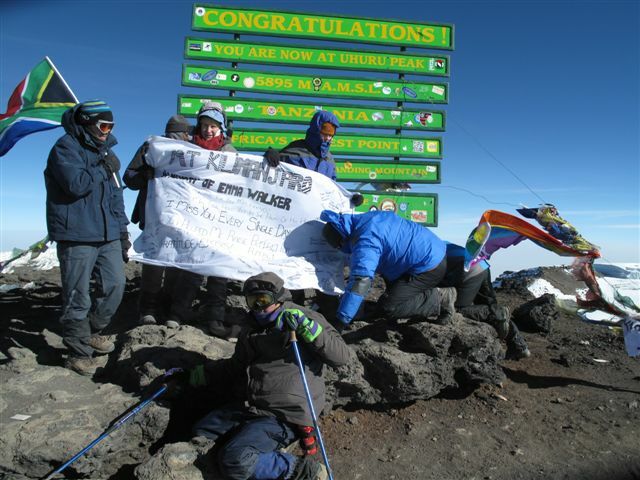 After a nice rest, our team was ready to move on to Uhuru Peak, the true summit of Kilimanjaro and the highest point of the mountain. Donna was not ready to move on yet and needed to rest a bit long. Not for one moment did the thought cross my mind that she wouldn’t go any further or that she might stop here and decide not to go further. 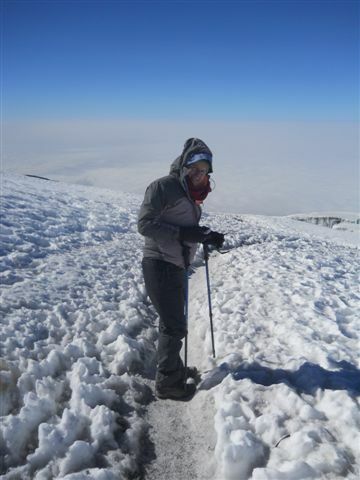 We were in this together and as my team members started heading out for the summit, I knew I would wait behind with her and when she was ready, we would walk to the summit together. As we sat for a bit this was the view that unfolded before us. 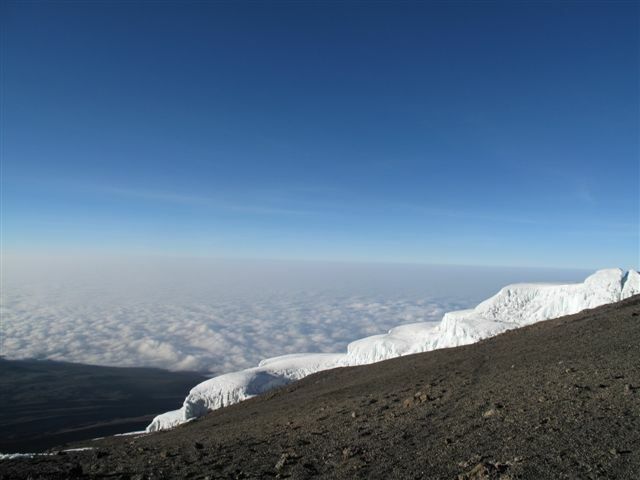 As we watched the rest of our team move on towards the summit, I finally took in the view before me. In a very surreal way I scanned the scene that lay before me. I saw a huge crater, frozen in time. The views were jaw-droppingly beautiful. A short while later Donna was feeling a bit better and ready to move to on to the summit but first we stopped to take some pics by the Stella Point sign. 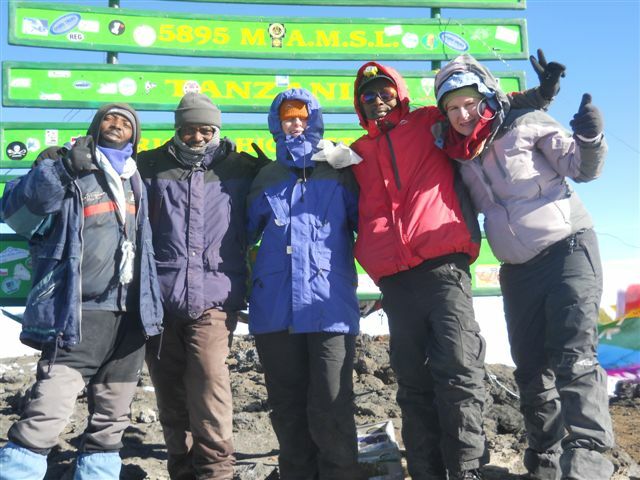 Once we had a few photos we headed towards the final summit, Uhuru Peak. It would take us about 45 minutes to an hour to get there. One of our guides had stayed back with us, for the life of me I can’t recall which one, I think it was Dixon. Our guide watched over us closely though making sure we were ok. Apparently, on this last stretch people really struggle. So close yet so far I guess. The air was really thin and your body and mind are beyond exhausted. Knowing I was near the summit somehow spurred me on. The walk was slow but so much easier with a gentle climb up and nowhere near as steep as before, and the views of the Southern Icefields were out of this world beautiful. I took as much of it in as I could. 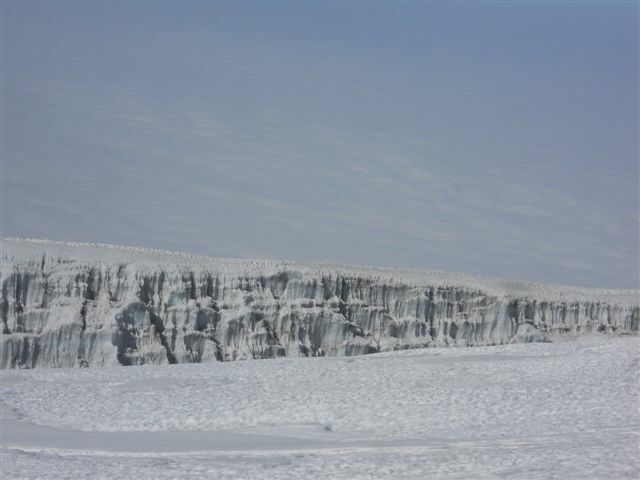 I knew I was one of the lucky ones who would get to see glaciers in my lifetime. The magnificent Southern Icefields. 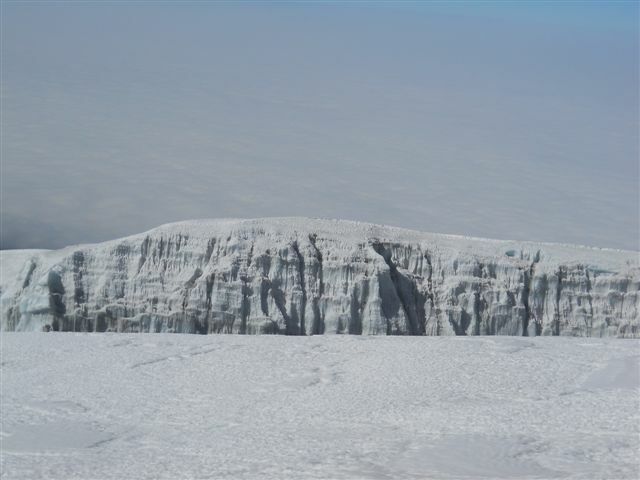 How incredible that I got to see these glaciers before they melt. As Donna and I walked towards the summit the path would begin to narrow leaving little space for us to navigate our feet. Looking back towards Stella Point a view looking over the crater. 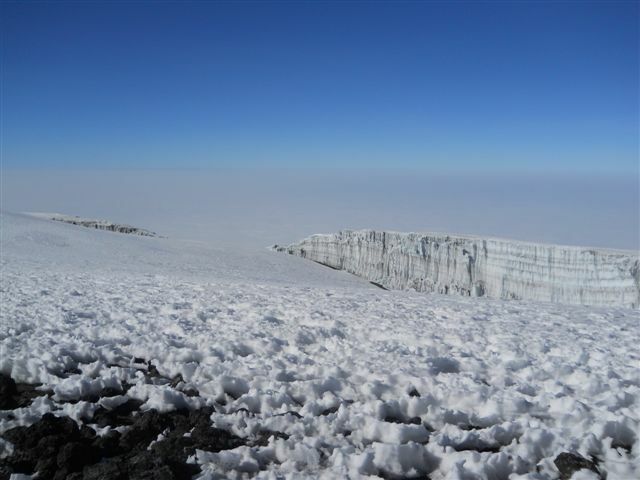 The Southern Icefield glaciers on our left as we headed towards the summit of Kilimanjaro. As we walked we were spoilt with such incredible views of the glaciers on our left. 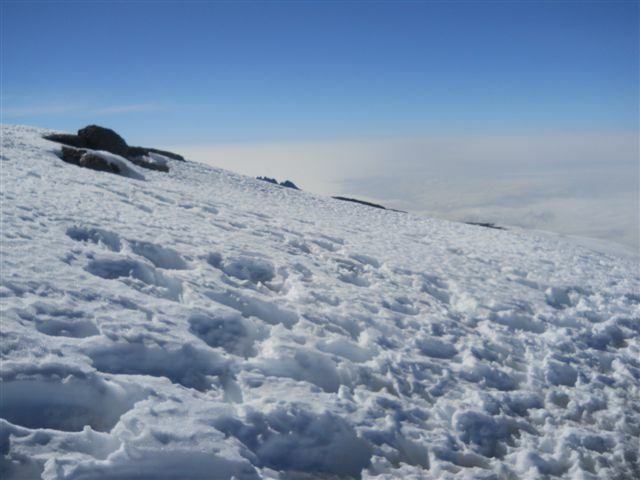 Eventually our path thinned out and we had a tiny path between icy snow that would lead us to Uhuru Peak. 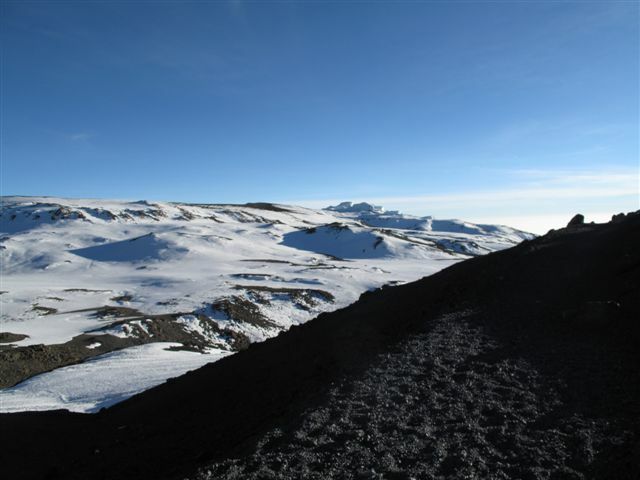 To our left we had the Southern Ice fields and to our right the earth dipped into the volcanic crater as we walked along the rim. 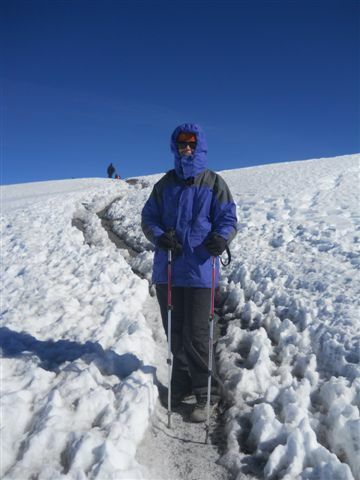 We walked slowly, Donna in front of me and our guide behind, stopping every 20 metres or so to catch our breath while we leaned on our trekking poles to rest. The air was thin and our exhausted bodies craved the fresh but thin air. Donna making her way to the summit. 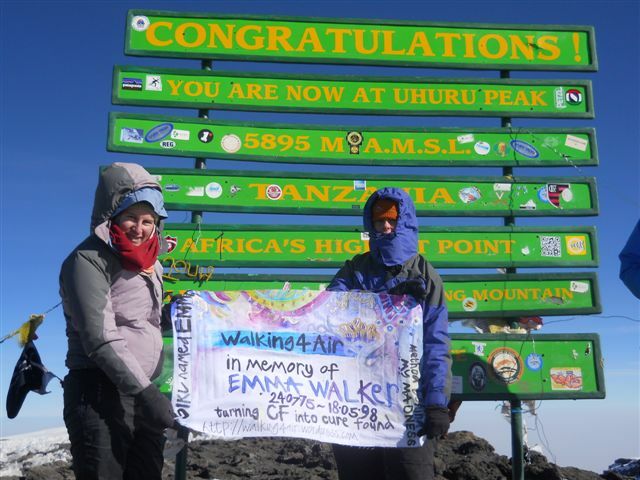 Soon after these pics were taken we would see the actual summit for the first time! A pic of me on my way to the summit. 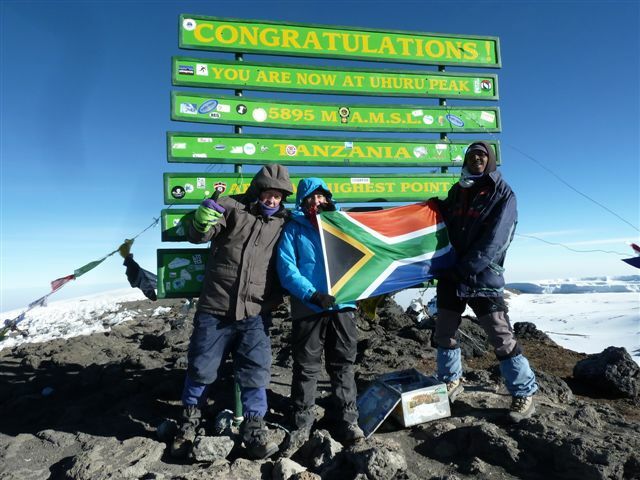 Soon after these pics were taken we would see the actual summit for the first time! 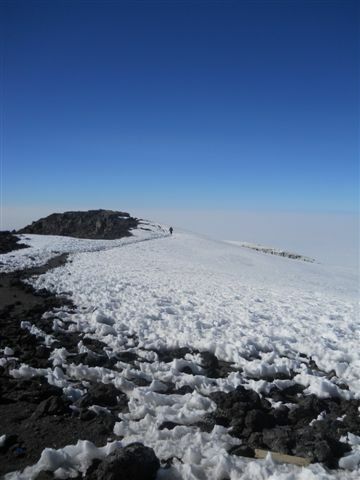 One thing I wanted more than anything in the months leading up to this trip was a snow-covered summit ~ I got my wish! 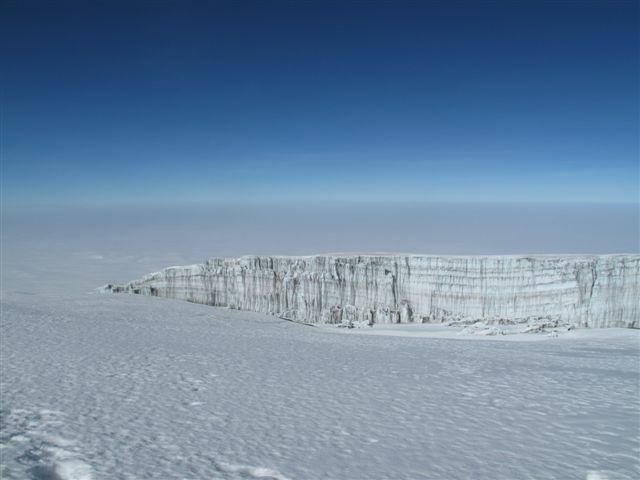 A view looking into the crater. The path narrowed even more and I began tripping over my own feet, stumbling around like I was drunk. The wind was howling and despite the sun rising in the blue sky above, it was still bitterly cold. All of a sudden Donna stopped abruptly in front of me. Again, my head down and not noticing she had stopped I almost bumped into her. She turned around and looked me straight in the eye. She was crying. She said between the tears “Lara, look over there, up ahead.” I leaned to my right to look around her and for the first time I saw it. There not too far off in the distance was the sign we had longed to see all night. 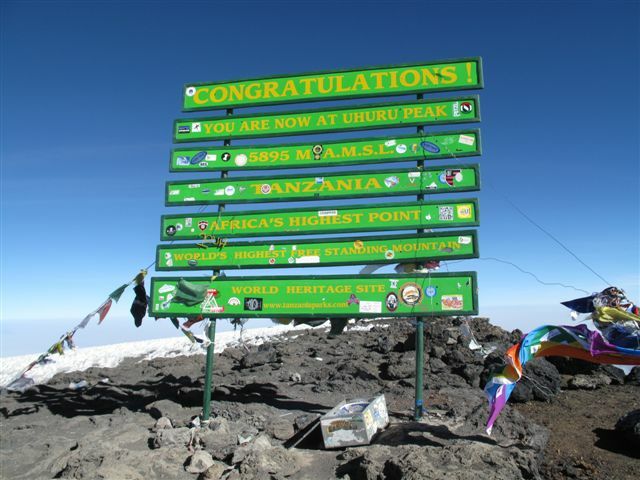 The sign that said “Congratulations” the sign that said you have arrived at the summit of Kilimanjaro. I started crying too and in that moment we hugged each other, both of us crying. I hugged Donna tight and told her “We gonna make it!” As we broke apart, I started laughing. Well, more like chuckling really as that was about all I could manage. I wanted to run but my body could only take one small step at a time. I wanted to scream and shout. I wanted to jump with pure joy. But what the mind wanted, the body was unable to do. Inside I was dancing! 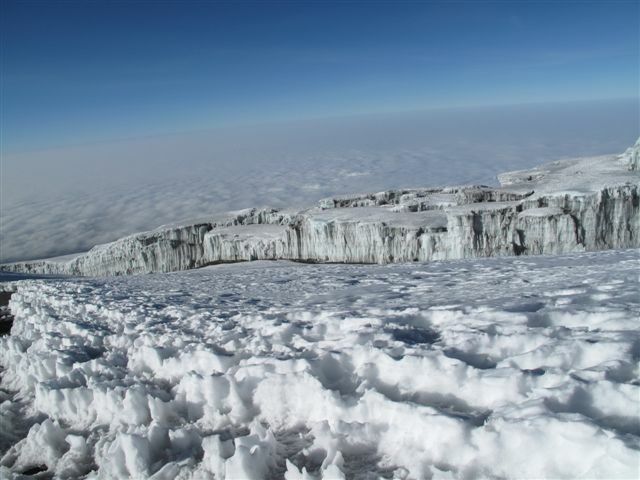 As I systematically put one foot in front of the other, taking my final steps to the summit, my mind was filled with giddy displays of images and emotions. The most predominant presence was Emma, my best friend who had succumbed to complications from Cystic Fibrosis 14 years ago. I thought of all the people who had contributed towards my fundraising for CF in order to help find a cure for this disease and to support those living with it. I thought of my family and friends back home. I remembered the first night on the mountain, standing in our campsite just above the rain forests when we saw the peak and how far out of reach it looked. Now I was about to stand on top of that peak. I had almost arrived. As we approach my heart was beating so fast and hard I was sure that everyone on top could hear it. Our fellow team members were still there and spotted us coming up and came rushing towards us. Between laughing and crying there was a frenzy of hugs and congratulations going around. The emotions finally spilled over, each one fuelled by so much emotion that we had carried along throughout the night. 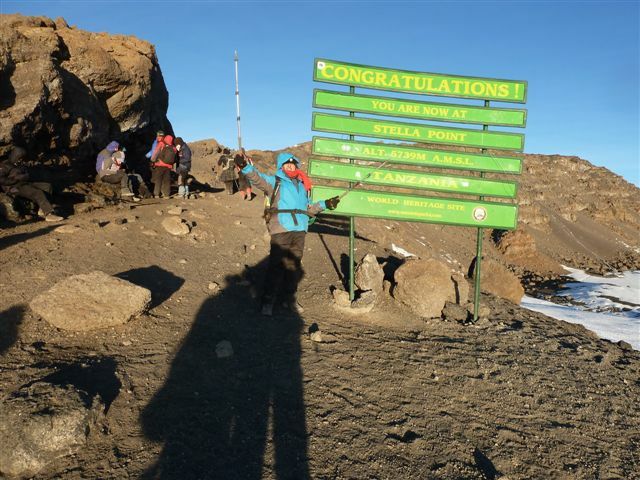 Maybe our team mates had been unsure as to whether we would make it to the top or if we had decided to stay at Stella Point. It didn’t matter, we were there now. There was such joy in the air as we congratulated each other. We had arrived. 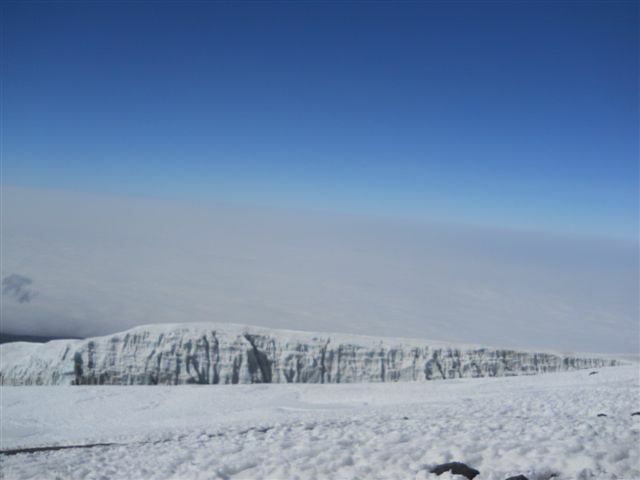 On the roof of Africa. The entire continent lay at our feet. The joy spilled over. Finally, we had made it! It was 8:45am on Friday, the 13th July 2012. We did it! 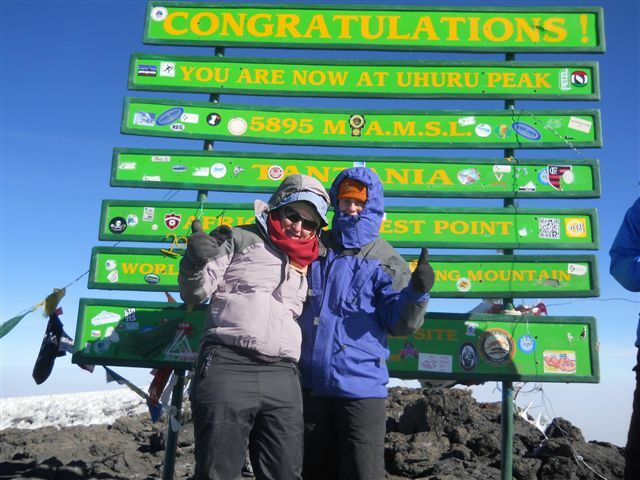 Donna and I standing on top of Kilimanjaro, summiting together at 08h45 on Friday, 13 July 2012 ~ What a great moment! Our team was together again. We had all made it to the summit. Judi, Simon, Thomas and yes, Anthony was amazingly still with us too! I don’t know how long we were there, maybe 20 minutes, maybe even double that. 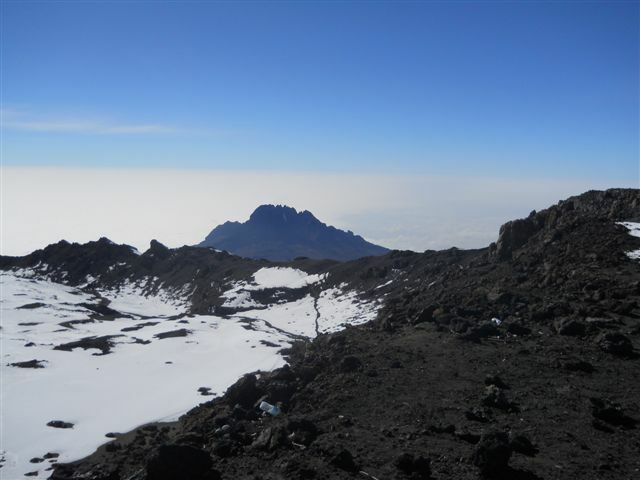 Although I had often heard before I left home the guides will usher you down quickly as it’s dangerous to stay up there too long due to the altitude. Every second spent up there chills you to the bone even more. With a combination of exhaustion and cold it makes it hard to get going again and we still had a number of hours to hike back down again before we reached base camp. 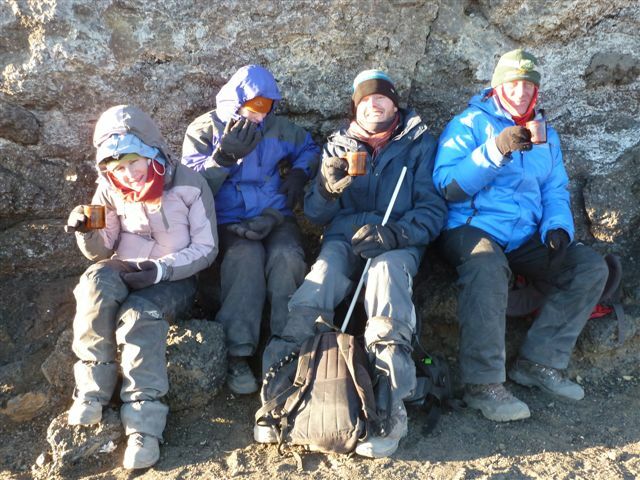 Although our guides watched us all closely, they didn’t hurry us up and allowed us to savour the moment of our summit success. 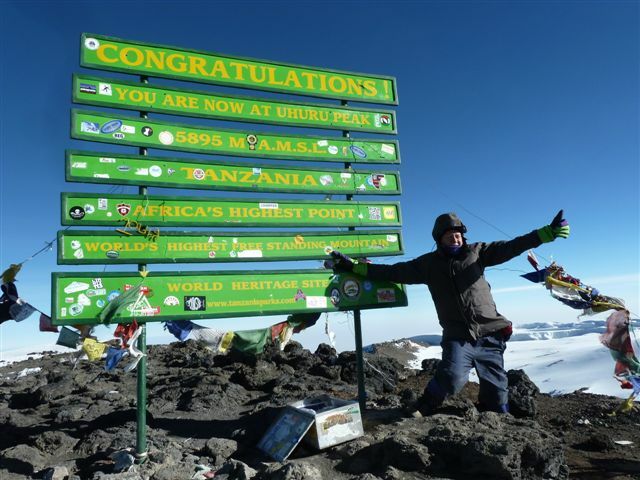 By the time Donna and I had arrived the summit was emptying of people, leaving us free to have our photos taken at the sign post. Strange things happen at the top and it’s hard to comprehend unless you have been there. You have pushed so hard throughout the night and with very little rest in-between. 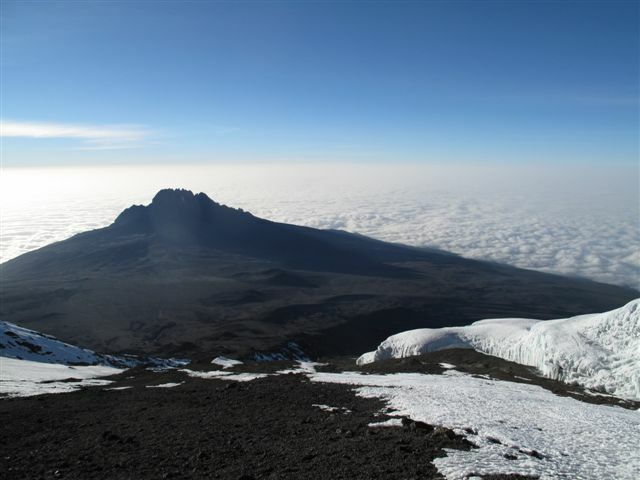 The views that lay before you as you stand on top of Kilimanjaro are breath-taking. But suddenly they seem immaterial. It’s ironic that you have kept your camera close to your body throughout the night in order to keep your batteries from dying in the extreme cold, ready to take huge amounts of photos when you reach the top. But it doesn’t work like that. Before you reach the summit you imagine all the photos you are going to take and how amazing it’s going to be. Truth is, you stand there and all you want to do it take the required photos and make your way down to Base Camp again. The cold is all-consuming and the exhaustion and lack of air is all too real. Physically I felt weak by pure exhaustion, while mentally I was ecstatic. Our turn at the sign came quickly and we posed for the obligatory photos. I pulled my banner out of my backpack, the one I had carried on me from Day One. The time had finally come to show the world. It is really not as glamorous as everyone thinks. The wind was so strong that all my team mates had to help me hold the banner. I wouldn’t have wanted it any other way. Except for Donna and I, we had all started as strangers and as we climbed we became friends. Friends who will forever share the incredible bond that we formed on that mountain. 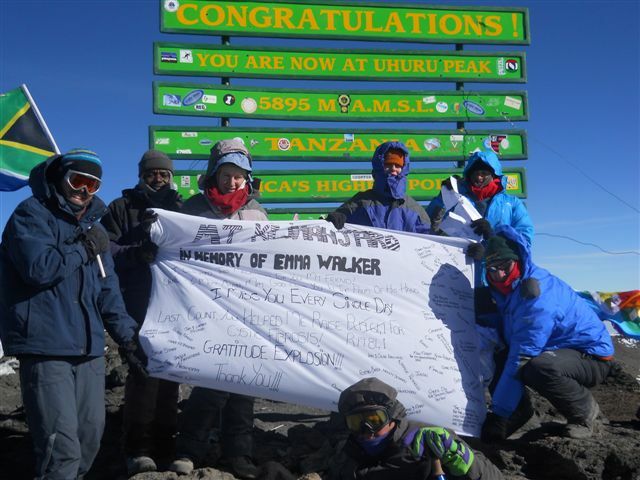 As the wind gusted we each grabbed a corner or edge of the banner and there in that moment my message to Emma unfolded at the summit along with my Thank You to each one who had helped me raise R20 000 for Cystic Fibrosis. I Climbed This Mountain For You My Friend! All around the message I had written the names of each person who had donated to my charity, The South African Cystic Fibrosis Trust. Just one donor was missing. The final donation that helped me reach R20 000. Unfortunately, I had received this information too late last night to add it to the sign. Our guides clicked away on the cameras. Once again I found myself feeling so grateful that our team was all together and even though Donna and I had arrived a short while later than our team mates, I was so glad that they were still here so that we could have a team photo together. My team mates and the banner I made in memory of Emma and as a thank you to each and everyone who had donated towards the Cystic Fibrosis charity I had chosen. 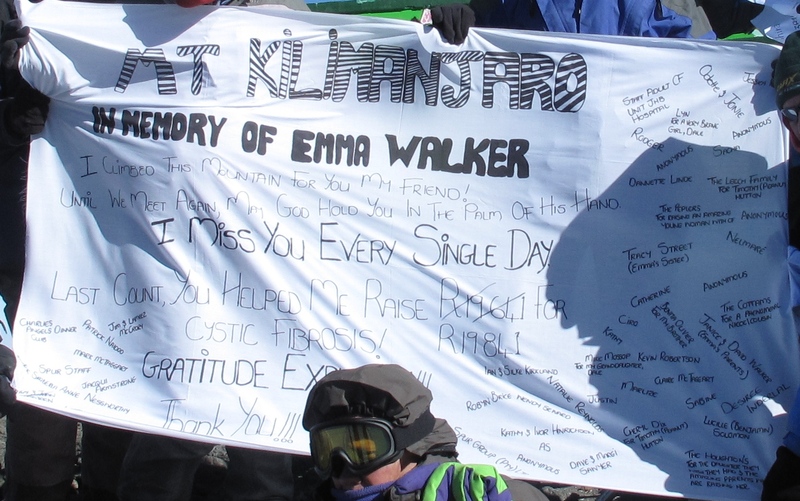 The banner for Emma up close. The only way to describe these three men is angels. Because of them we summited. From left to right: Moses, Dickson, me, Milton and Donna. Our absolute angels throughout the night as we climbed to summit. I personally owe so much of my success to them! Sometimes in life I come up with some crazy ideas. I’ve lost a lot of dear friends in life through death and four years ago I nearly had my own life snatched away. I have through a series of events come to realise how important it is to live your dreams and to relentlessly pursue them, no matter what. 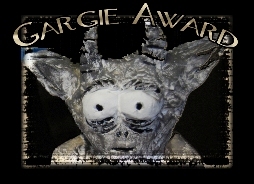 As I have mentioned before, sometimes people look at me with crazy eyes when I say what’s next. 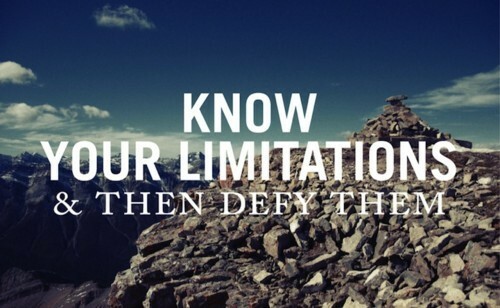 Mostly I know they don’t really believe it will happen or even that I will be able to do it. From the moment I started planning this trip three years ago there was a sign I knew I would do for my parents. In the end I had taken huge, bright orange coloured cardboard with me to do the sign on, but in crazy moments I left it back at the hotel so one night while on the mountain I quickly scribbled the note I had originally wanted to put on the brightly coloured cardboard onto an A4 piece of paper. I knew that this wasn’t an opportunity I could miss. 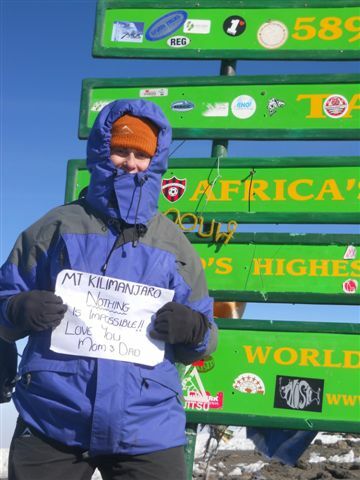 Below are the photo’s of the scribbled sign especially for my mom and dad! The pic for my mom and dad! Proof that nothing is impossible, you just have to set your mind to it! For my mom and dad ~ Nothing is impossible, if you ever needed proof, here it is!! Note the tell-tale signs of the smile behind my hood, it’s huge! Thinking the photos were all done, I stepped off the platform of rocks that held the summit sign only to be called back by Donna. She had something in her hand, another banner and she was asking me to hold it. This time it was a smaller banner and much easier to hold in the howling wind. I didn’t know what it was or what it said as we posed for photos. I don’t recall what made me look at it, if someone had said to me it’s for me or ‘have your read it’ but I remember holding it while I moved to the front of the banner to read it. What I saw brought a fresh wave of tears and completely overwhelmed me. There on the banner Donna had painted a replica of my blog’s design and had taken words from my blog, such as a ‘A Girl Named Emma’ and ‘Turning CF into Cure Found’. I had no idea that she had done this and I wondered how she had kept it hidden from me all this time. I hugged her tightly, no words enough to say thank you. Donna and I holding up the sign that she had painted for me, a replica of my blog design. Such a special moment! The emotions washed over me as I stood there taking it all in. 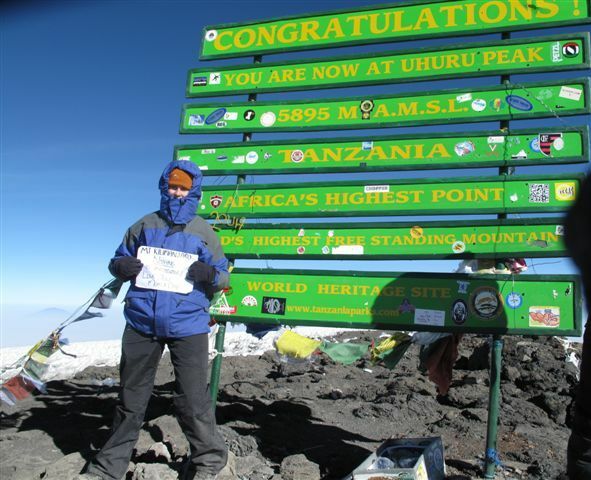 I had reached the top of Kilimanjaro and my body silently screamed in triumph. I stood there knowing that something significant had changed inside of me forever. All my fears and uncertainties dissipated in that moment, leaving something new and untouched. Standing for a moment alone, taking it all in! Unexpectedly, someone was walking towards me, his eyes alight and the biggest smile began to spread across his face. It was Simon. I stood there watching him get closer and I couldn’t help but smile back at him. As he drew closer to me he said “I don’t think I have congratulated you yet” and he simply spread his arms open wide and I stumbled into them, holding on tightly as the emotions washed over me yet again. He hugged me so tightly and in that moment it all became so real. I closed my eyes and let the joy of the moment wash over me so completely. That was the moment for me that really anchored what I had just done and achieved. We stood in that embrace for what felt forever. Just as well because I didn’t want it to end. Pure happiness filled every fibre of my being. Hypnotized by the beauty of our surroundings and the moment, we stood there together for a long time. That was until someone from our group came up to us and started talking to us bringing us back to reality with a bang! Now all that was left to do was to descend. 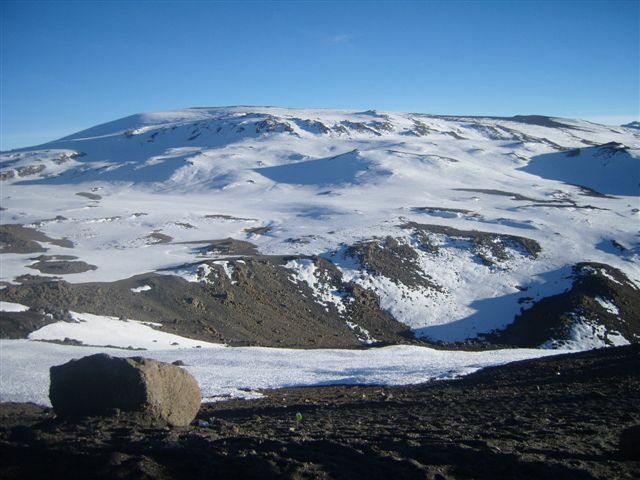 We began gathering our bags and poles and started making our way back to Stella Point where we would begin our descent. My heart sunk a little as I realised that it was not quite over yet. Now we had to go down. My body felt weak at the thought of this. 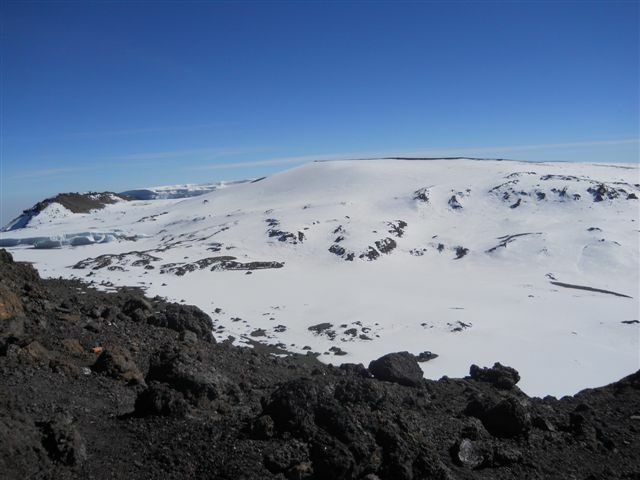 A view over the crater rim as we headed back to Stella Point, ready to make our descent back to Base Camp. 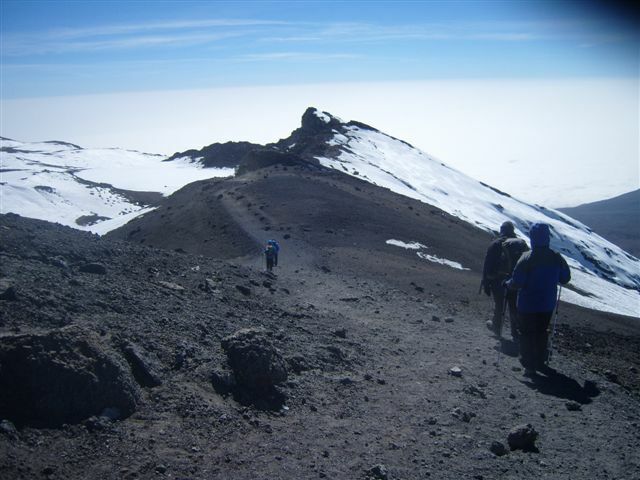 The descent back to Barafu (base camp) would take us roughly 3 hours. We have two choices to walk down or to ‘ski’ down the slope, which entails skidding/running down the loose gravel at pretty fast speeds! We started off walking, Judi and Thomas were upfront somewhere. Donna and I walked with Simon and Anthony and the guides. Anthony and Simon stopped more frequently, the effects of the altitude taking its toll. Milton and Moses stayed with them. Donna, also feeling the effects of the altitude needed to get lower, the quicker you descent the better, or so they told us. I was still feeling ok thanks to the Diamox I had been taking. That’s when Dickson, our guide walking with us, gave Donna and I a brief introduction into the art of downhill skiing in the loose scree using our hiking poles and boots. 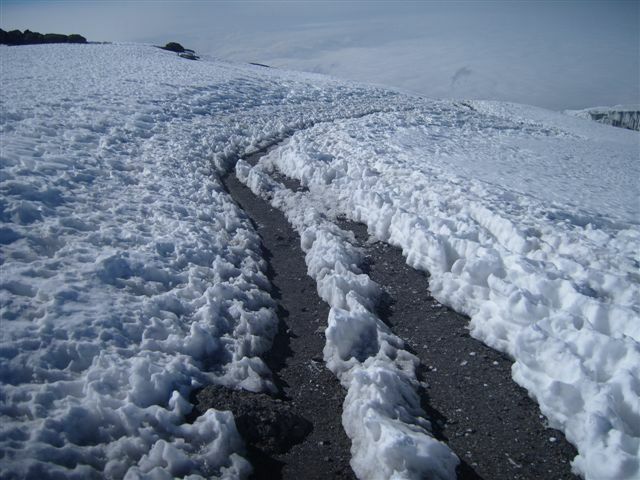 As you begin to ski you treat the loose scree like snow, and you plunge forward using your poles for balance. At first Donna and I took it slowly, not quite trusting the process but soon we graduated from a slow downward movement to a momentous continuous ski movement. I turned back every now and again to see where the Ant and Simon were. They were coming but they were still walking. As we stopped and caught our breath, I felt momentarily better again. I turned around and saw that Ant and Simon, along with the guides had stopped too, resting on some rocks. A short while later Donna was ready to go, quickly we got back into rhythm as we skied down the slope. Another stop, this time the guys behind us were out of sight. We waited a while but they didn’t come into sight. Dickson said they will be well looked after as Moses and Milton were with them. We so badly wanted to get back to camp so that we could let sleep take over. Our morning descent was filled with a continuous process of ski, stop, ski, stop. Eventually we saw Base Camp in the distance. It was a good feeling. By now we had taken some layers of clothes off. The sun was hot and the journey down was still taxing. Judi and Thomas had also come into our sight up ahead of us. The boys were quite far back now and were completely out of sight. We hope they were ok. We were close now. Rest was not far away. Base Camp was in sight, rest would soon come and sleep would take over completely. It wasn’t long now. 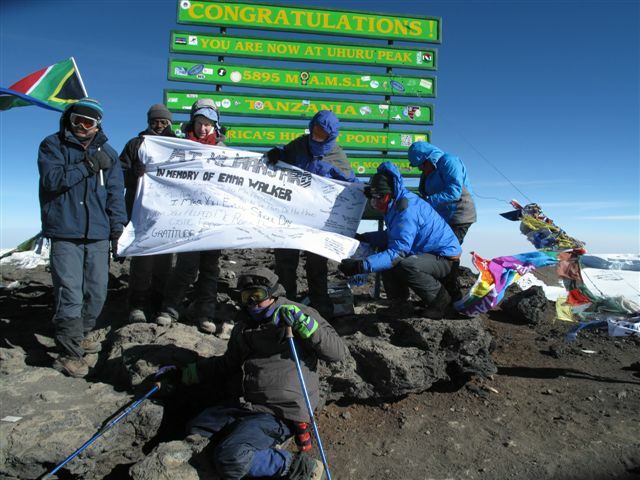 When we got back to base camp members of our large team of porters congratulated us. It was touching moments as they all seem genuinely happy for us. It didn’t take long before Judi, Thomas, Donna and I crawl into our tents and literally passed out. We were beyond exhausted. Before we left on this trip I had a list saved on my phone of whom I wanted to phone from the summit and who I wanted to send a quick text message to saying I had summited. Although my intentions were good, when you reach the top of the mountain all those intentions fly out window. Sitting in the tent I desperately wanted to send my mom and my best friend back home a quick message saying I had successfully summited. Donna asked me if I would wait as she didn’t want it on facebook as then her sister would see and she in turn would tell her mom. She wanted to be able to phone her mom and tell her in person but first she wanted to sleep. I agreed, grateful for the sleep that would come sooner and trying to find the energy to type a message with my still stinging fingertips would have been hard. I would phone home later when I woke. As I lay down I thought of Simon and Anthony still out there on the slopes making their way down. I hoped they were doing ok and that they were close and that soon they could rest too. 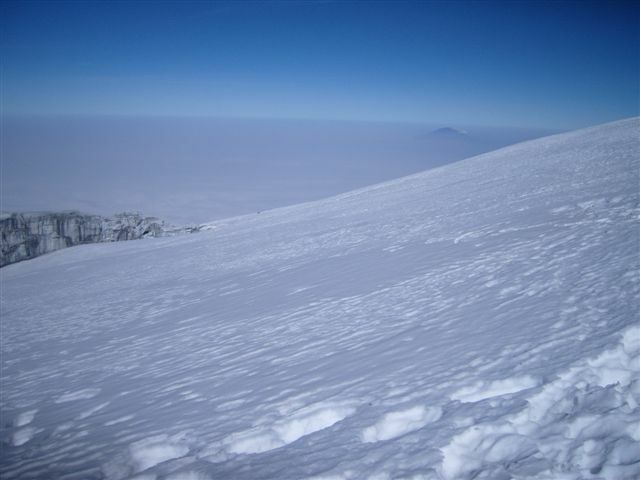 Sleep came quickly and for the first time since arriving on the mountain I slept soundly for a few hours…. The events of the past 24 hours had proven to me that I was wholly alive, and no matter what transpired from there on out, I had truly lived! 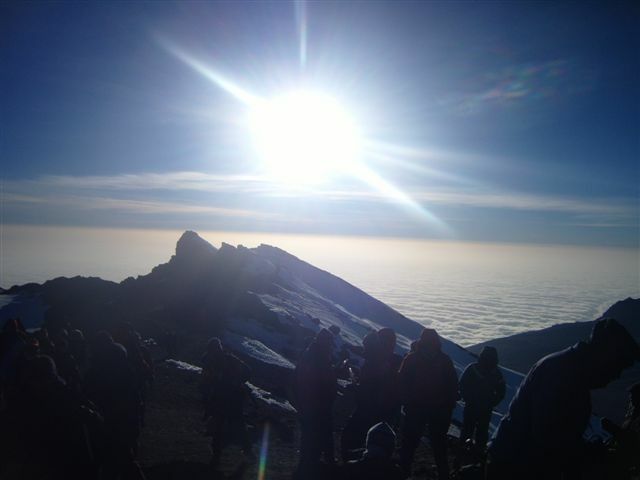 Previous Enveloped in Darkness, Our Summit Bid Began ~ A Journey to the Top of Kilimanjaro Next Happy ChooseDay!